We have the most experienced management team, with our eight partners averaging over 18 years in the business, a very knowledgeable sales team, and an excellent support staff—so what does that mean for you? We have been around for so long for a reason; we are passionate about matching people with the home that is perfect for them and our reputation demonstrates our success. Our longstanding relationships with everyone from park managers and owners to banks and insurance companies will help make your buying or selling process a pleasant and successful one. We pride ourselves on providing excellent service every step of the way to our customers and are dedicated to making every transaction with us both convenient and pleasant. We endeavor to make the entire buying or selling process as simple and hassle-free as possible and will handle as much of the legwork for you as possible. We have a very knowledgeable sales team supported by experienced managers and administrators, so whatever the question or problem is, we will have a solution. We always follow through with our customers and are not satisfied until they are. Our homes represent the latest and greatest in manufactured home building and are of a quality and value beyond compare—so shop around, we encourage it! One positive to come out of the recession is that manufacturers have needed to innovate and improve their homes drastically to survive and we can definitely see the results. Our two manufacturers, Karsten and Skyline, have done well and are in great shape moving forward. We use two manufacturers to guarantee that you get the best price for your home. Also, we have a wide variety of floor plans and styles to suite every taste, each one of which is customizable. So if you can dream it, we can get it built! 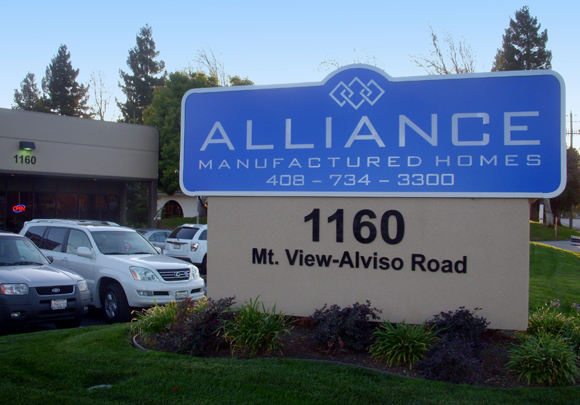 At Alliance, we have our own construction company, our own finance department, and our own insurance representatives. We are unique in that we set up our own homes, providing both more control over the process and savings in price, which are then passed down to our customers. Our finance and insurance departments allow you to take care of all your housing needs in one place—saving time, money, and stress!